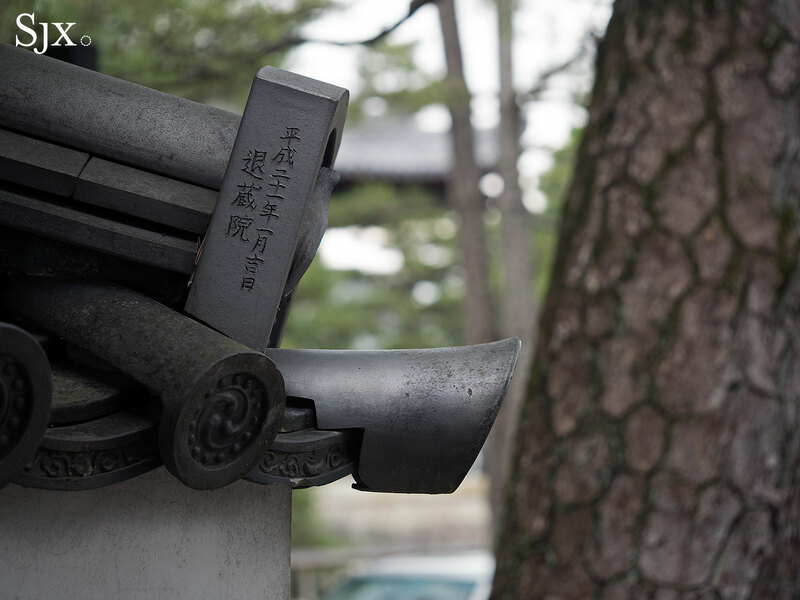 Pondering the subtleties of Kyoto and the Vacheron Constantin's new luxury sports watch. Japan’s ancient capital, Kyoto was fortunately spared major damage during the Second World War, leaving it intact, pretty and subtle. While Tokyo is an incredible metropolis, it has a distinct and dreary sixties and seventies style about it. Kyoto, on the other hand, is charming. The characters refer to the 21st year of the Heisei period, or 2009. 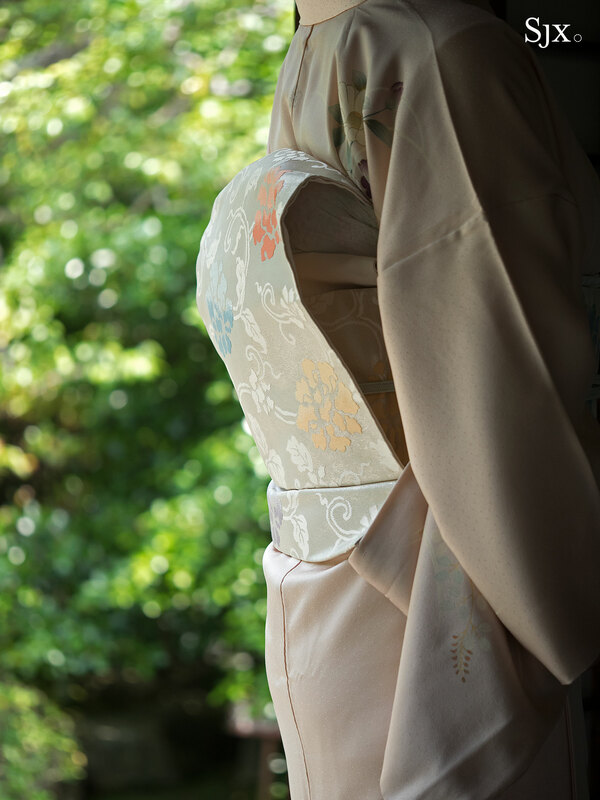 Traditional Japanese aesthetics often emphasise simplicity, elegance, with an implication of quality craft. 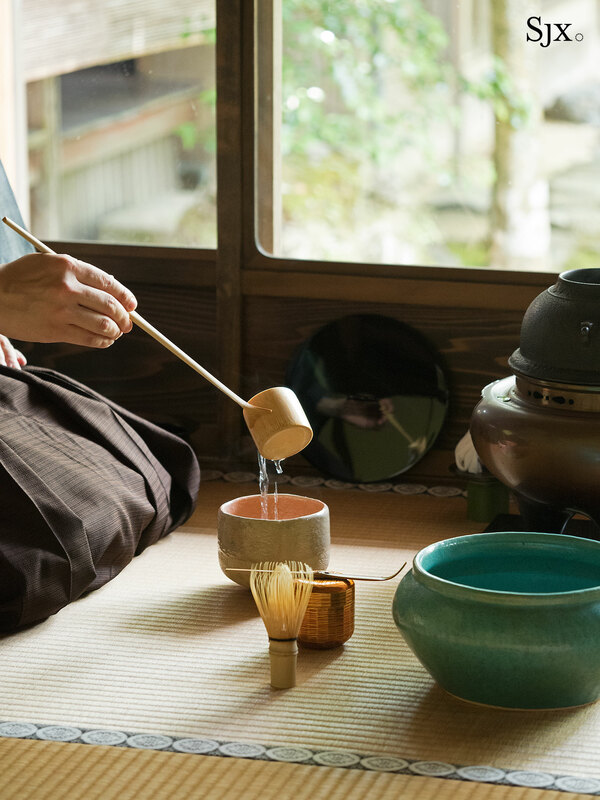 These qualities are especially evident in a city like Kyoto, where traditional manners and objects are preserved and prolific. 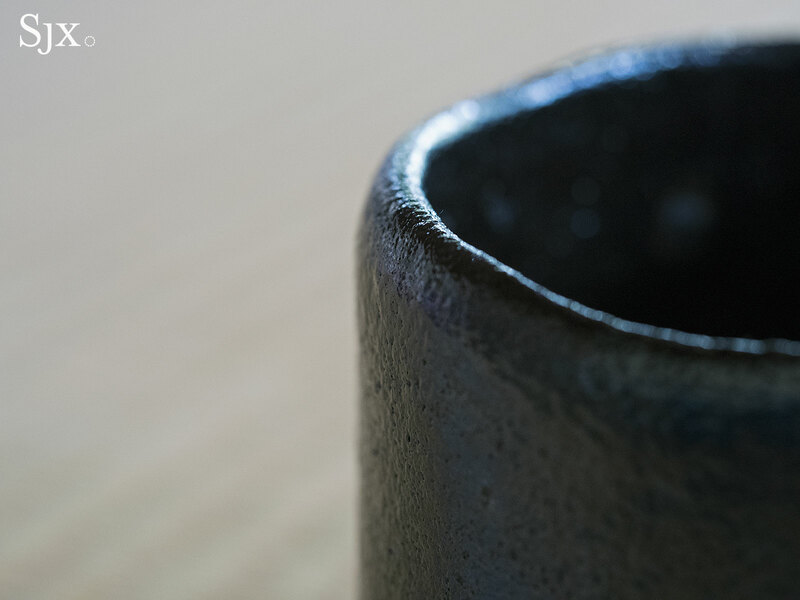 It is a pleasure to quietly observe the texture of kimono fabric or the surface of a Raku teacup. 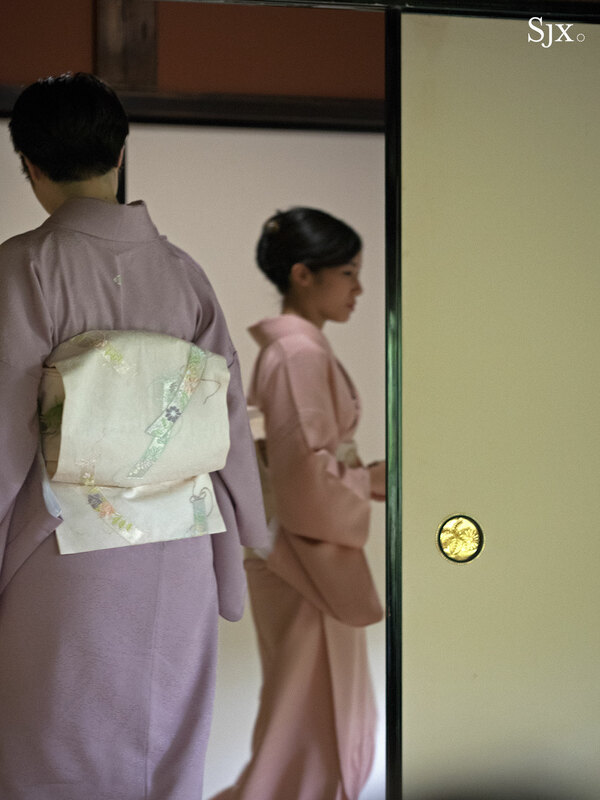 But despite being authentically antique, Kyoto, like the rest of Japan, has enough technology everywhere that it feels like a modern city. Old cities, especially grand and unchanging ones, can sometimes feel stuffy and frozen in time. But not in Japan. Where else in the world can one dine at a three hundred year old restaurant with a robotic toilet seat in the washroom? 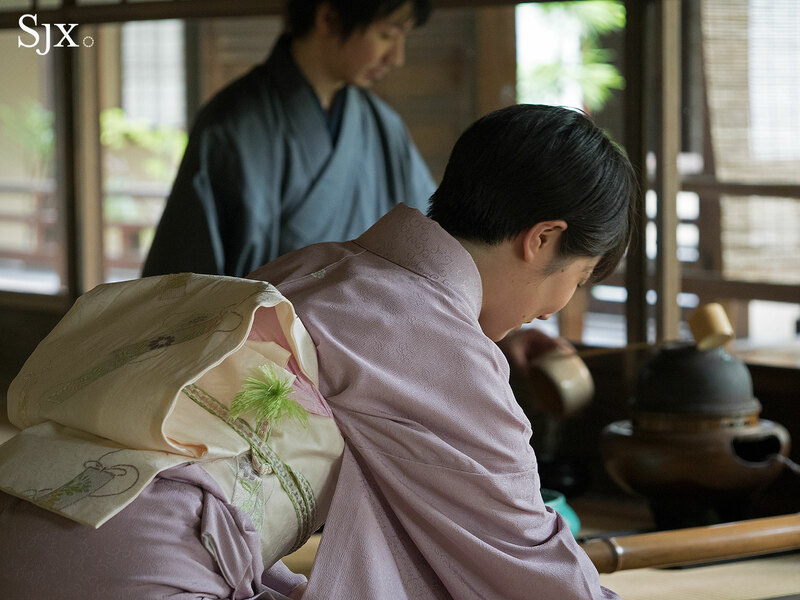 Vacheron Constantin recently threw a big party in Japan, attended by photographer Steve McCurry, to launch the Overseas sports watch, which included a stop in Kyoto. Your correspondent was invited along, and have the Overseas World Time on his wrist for a day. 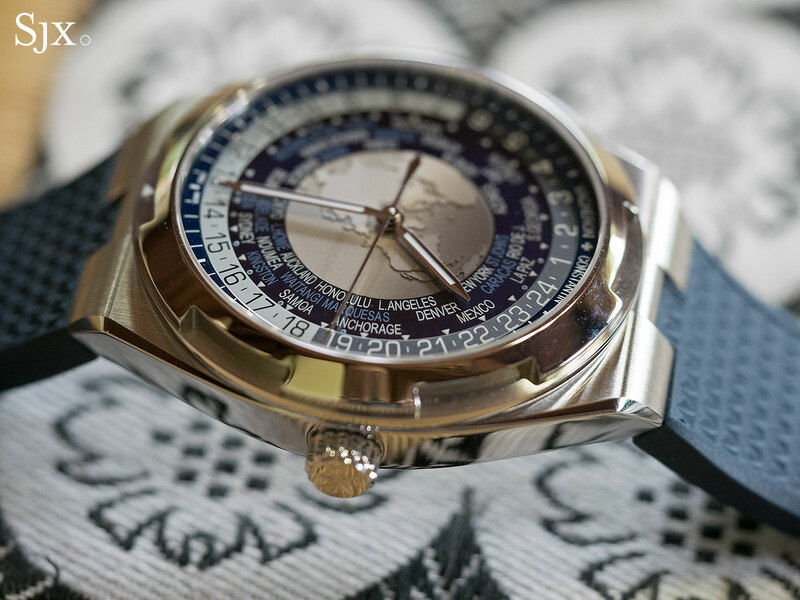 In the world of luxury sports watches – timepieces that are almost too precious to be tossed around – Vacheron Constantin’s entry is the underdog some two decades in the making, but the Overseas is finally what it should be. Audemars Piguet founded the segment when it introduced the Royal Oak in 1972, and Patek Philippe got on the bandwagon with the Nautilus in 1976. Both were designed by Gerald Genta, the inventive watch designer who enjoyed his zenith in the 1970s. 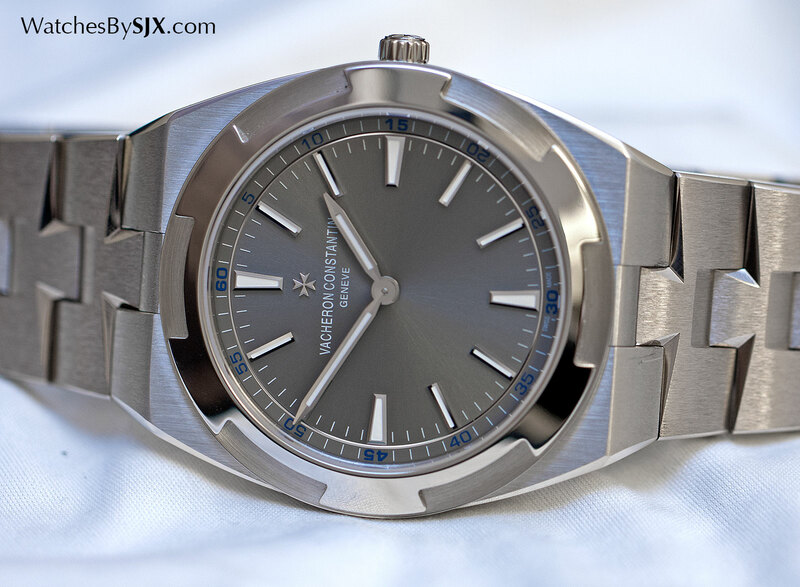 Vacheron Constantin only arrived at the party a year later with the somewhat unenthusiastic 222, designed by Jorg Hysek who later became a star in the 1990s. The 222 evolves into the similarly lukewarm Phidias, before the fit and properly sporty Overseas finally arrived in 1996. 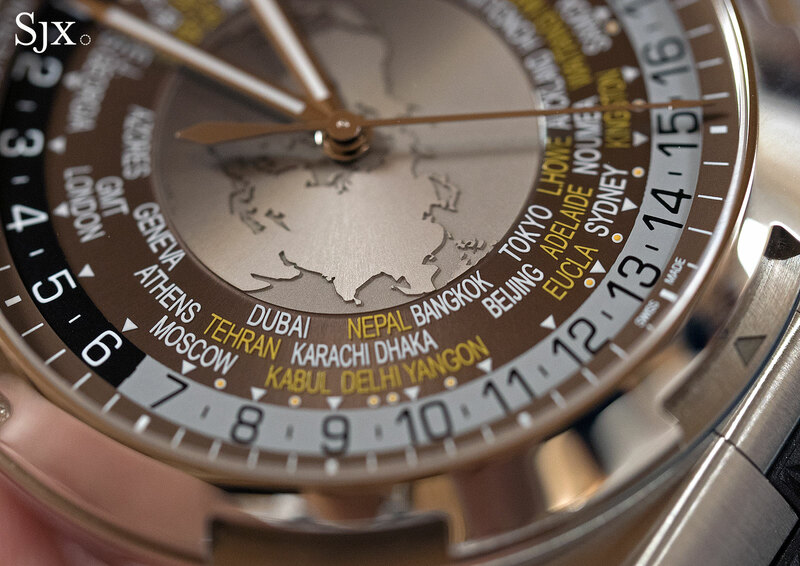 At SIHH 2016, a full two decades later, the third generation Overseas was unveiled. At a distance the third generation Overseas looks very much like the last one; the bezel is familiar, as is the bracelet. 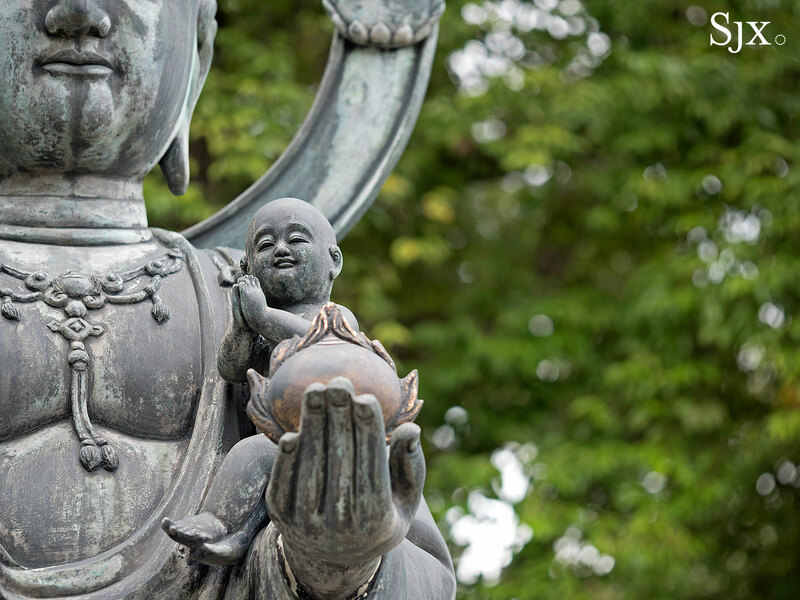 The subtleties of the new Overseas are nuanced, but significant. 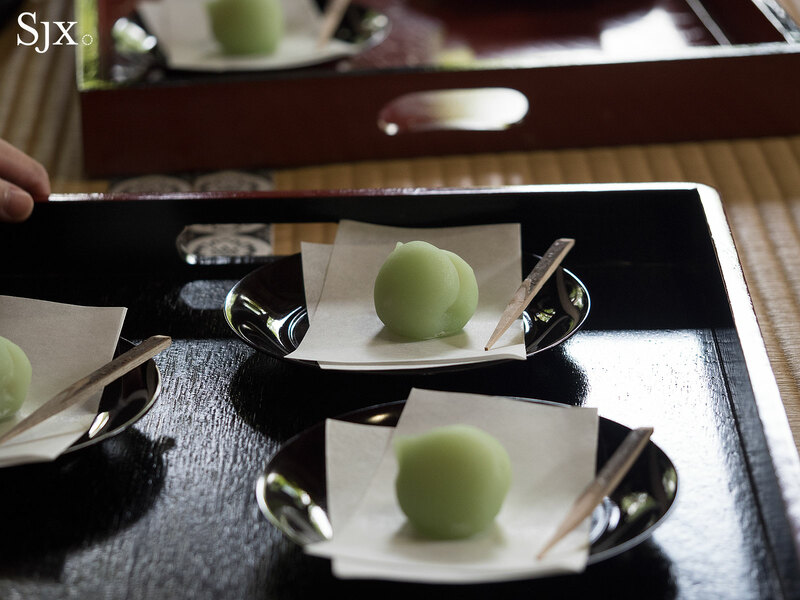 Like a visit to Kyoto, the new Overseas needs to be observed and tangibly appreciated in order to be understood. 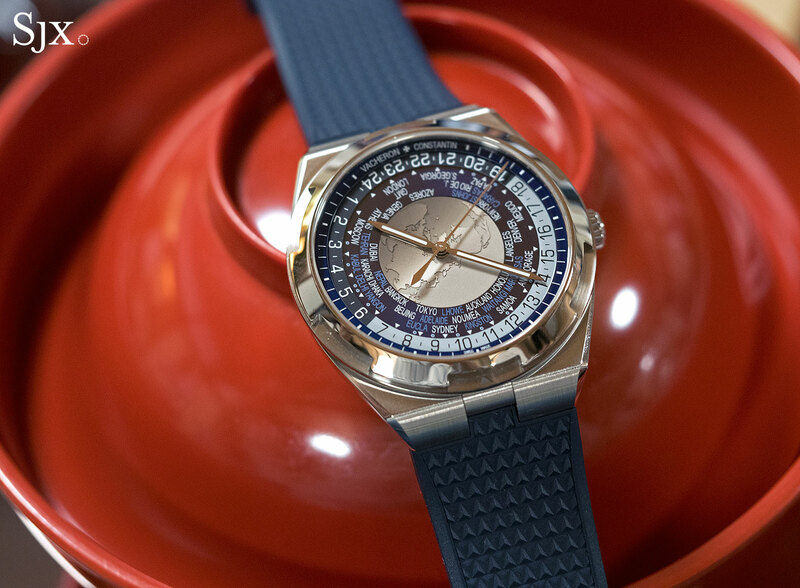 Being the underdog in the luxury sports watch race, Vacheron Constantin needs to run harder, and that extra effort is obvious in the latest Overseas. The efforts were pointed in a practical direction, and are neither flamboyant nor dramatic but satisfying useful. Take for example the strap attachment of the new Overseas. A spring-loaded catch that’s easily operated with a fingernail instantly releases the bracelet or strap, allowing the wearer to rapidly swap between the two. This is not a novel idea, but it is a very good one, especially considering the competition demands a screwdriver and nimble fingers to exchange straps. The well thought out utility extends to the steel bracelet, which includes a micro-extension so the bracelet can be pulled to lengthen it between two to four millimetres. 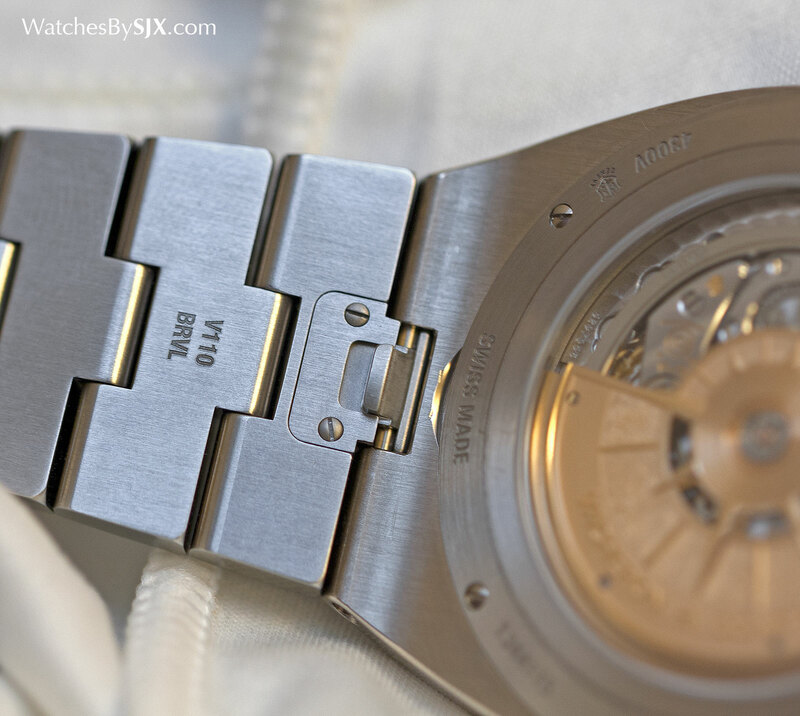 Ditto for the folding clasp, which can be swiftly rotated and removed from the rubber strap and mounted on the crocodile band. Visually the new Overseas takes after its predecessors, with the lineage instantly discernible. 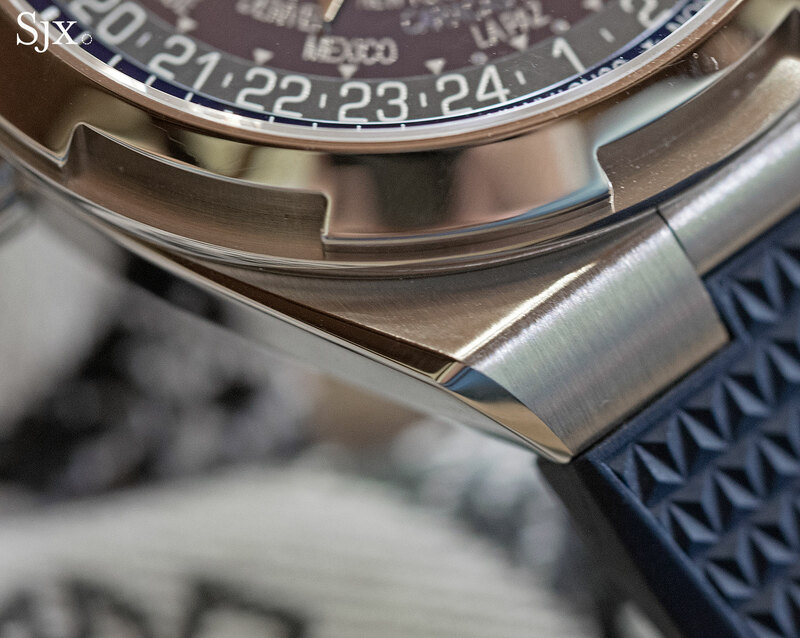 The case has a more pronounced tonneau shape than before, which accentuates the 1970s style that gave birth to the original Vacheron Constantin sports watch. But the flanks of the case rise outwards, giving the bezel a larger footprint than the case back. This is an uncommon design feature that makes the watch seem larger than it is, an understandable goal for a sports watch. 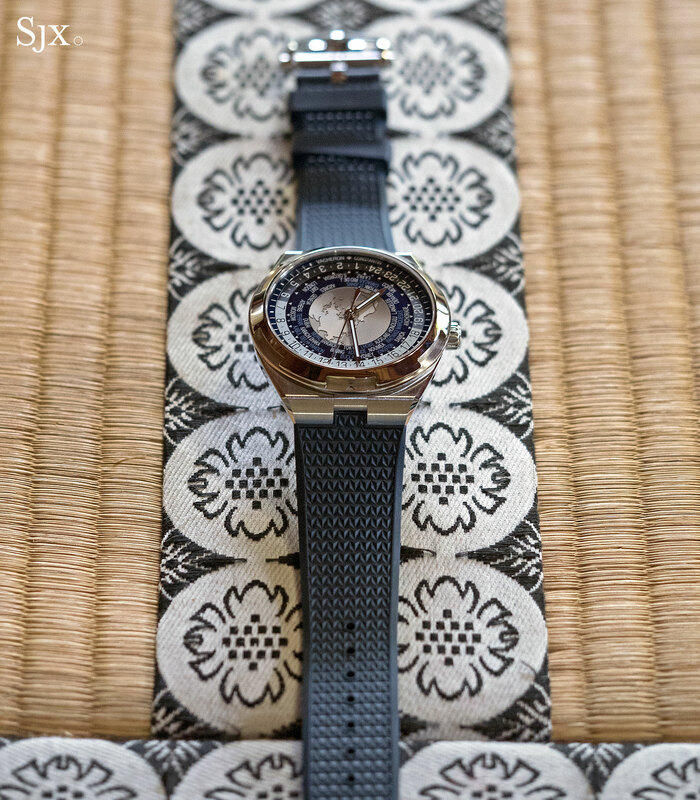 While on the smaller Overseas models it works well (the basic, time-only Overseas is 41mm), on the 43.5mm Overseas World Time the case form pushes the limits of practical size. The finishing of the case is carefully done, with the requisite brushed surfaces meeting mirror-polished bevels along a neat border. But because the Overseas case is marginally simple than those of its two great rivals, the finishing of the case is not as complex. 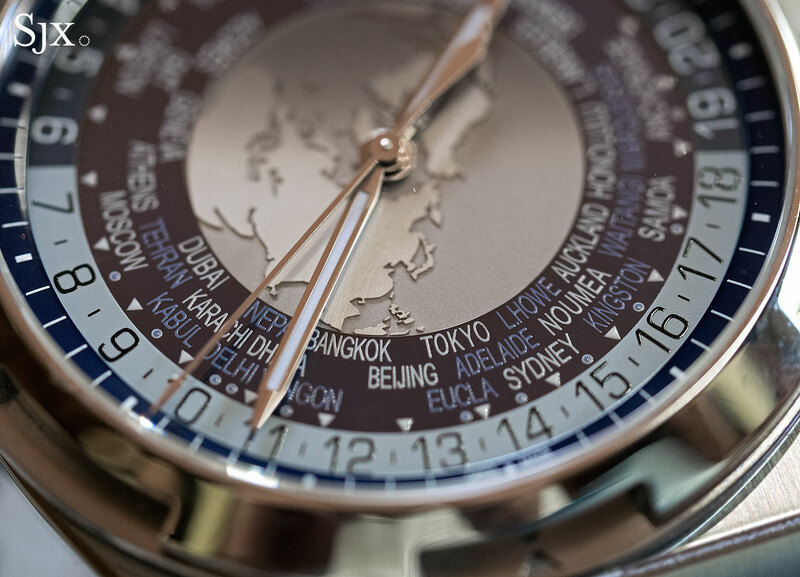 Unlike most world time watches that have the standard 24 time zones, the Overseas World Time boasts 37 time zones. That is a marginal advantage – most of the extra time zones are rarely visited places like Iran and Afghanistan – that means more cities on the dial, making it slightly less legible. 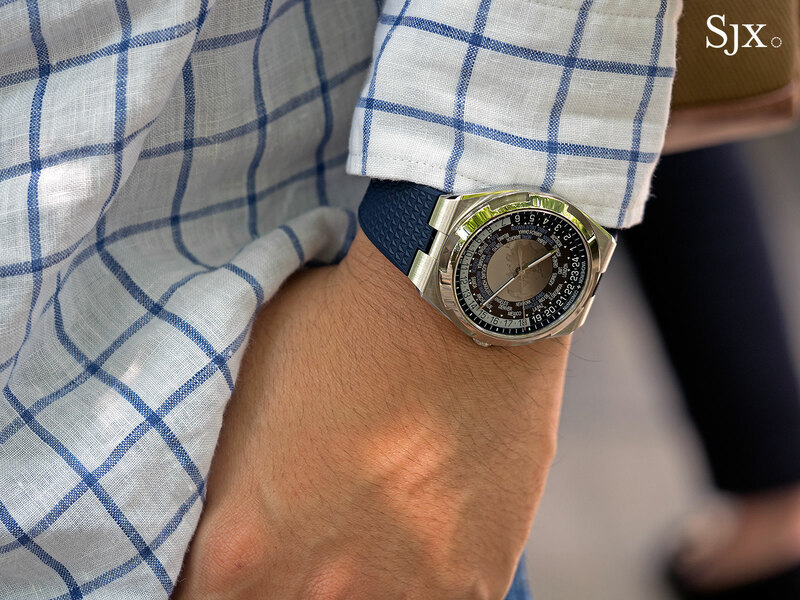 Fortunately the world map in the centre is easily readable, being combined with a sapphire disc that has one halve tinted to serve as a day and night display. The continents on the map are actually in relief, intricately formed and worth a look up close. The winners in the Overseas line-up are undoubtedly the Ultra-Thins, the time-only and perpetual calendar. Both are gorgeously slim and powered by the refined, sophisticated and challenging calibre 1120. But both also verge on being preposterously expensive; the Ultra-Thin time-only costs just under €50,000, or about US$55,000. 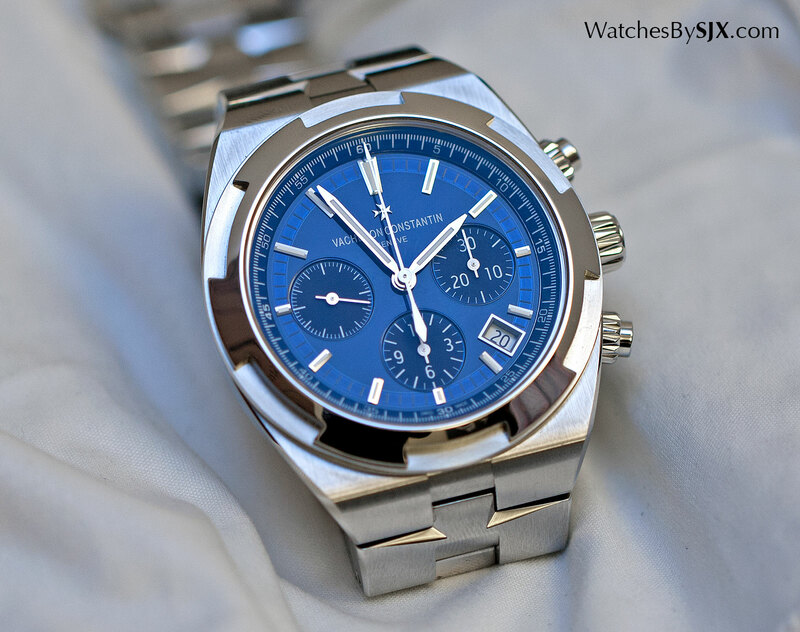 Arguably the best proposition is the Overseas Chronograph that costs just under US$29,000 in steel. Big and sporty without being unwieldy, the stopwatch function gives it the look of a sports watch, while the movement is the respectable, in-house calibre 5200. The third generation Overseas is by far the best. Though it lacks the name recognition of its peers in the luxury sports watch segment, the Overseas can go toe to toe with the competition. 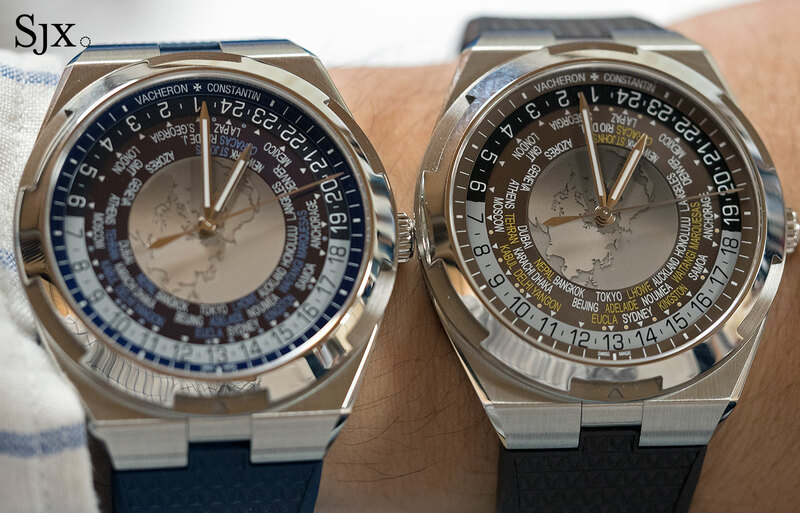 Vacheron Constantin adds a 37-time zone travel watch to its luxury sports watch line-up with the Overseas World Time. Here's all you need to know, including the price.